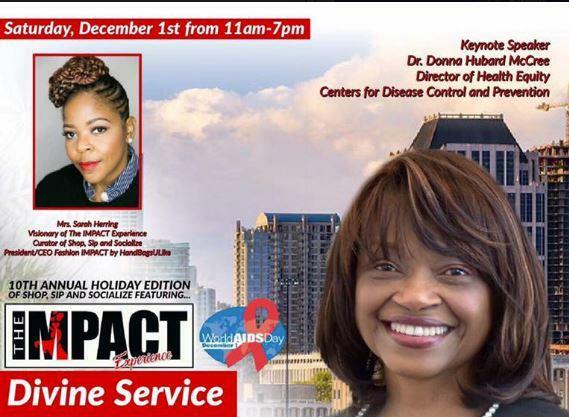 Saturday morning at 8am on The Local Take on WCLK I speak with Sarah Herring about Impact Experience and their Shop, Sip and Socialize event taking place Saturday, December 1st from 11am - 7pm at the Stone Ridge Event Center in Stone Mountain, GA. This is an event held in conjunction with the 30th annual observation of World AIDS Day. Ms. Herring explains that the Impact Experience is for the whole family, there will be a health pavillion with screenings for diabetes and hypertension. The Empowerment Resource Center will also be on hand for FREE HIV screenings and information about preventing the transmission of the disease. They will share information about PrEP which prevents the spread of HIV by taking the viral load to zero. The will even be a performance by R&B Singer Keke Wyatt! There is no need to register. As you go about your day this Saturday just stop by to enjoy the festivities and learn about resources in the community to help you live your best life. The Impact Experience - Shop, Sip and Socialize gathering will take place at the Stone Ridge Event Center located at 1750 Stone Ridge Drive, Stone Mountain, GA 30083. Kiplyn Primus talks with Sarah Herring about World AIDS Day on The Local Take on WCLK. The Local Take features community engagement from Atlanta's Jazz Station 91.9 WCLK.